Presenting categories has never been easier. 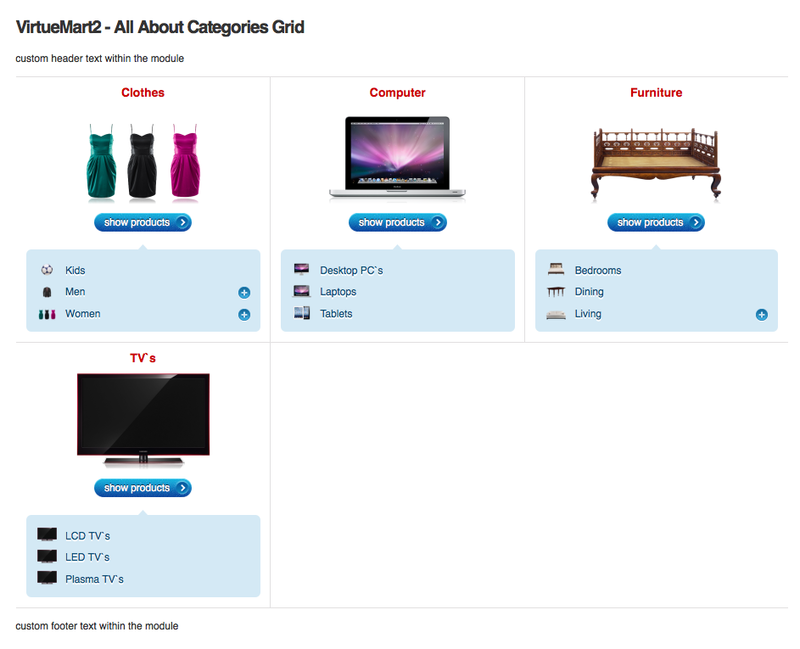 This VirtueMart module allows you to present your categories in a module. It offers you many settings and different display. 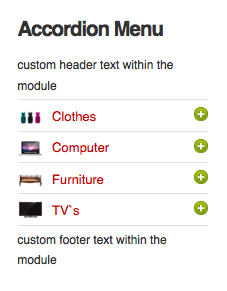 Generally, the module is delivered with two different layouts that are shown on the screenshots: a grid Layout and an accordion menu layout. In both layouts, we use a nice slide effect to show and hide the subcategies. What does "Along category tree" mean? Lets pretend you have a Category A with two Subcategories B and C. If the user visits the Category A, the module will only show him the Subcategories B and C and no other anymore. If you want to, you can limit the display to show only the categories of a certain category. You can also define the maximum number of categories and the number of categories to be shown per row as well as the category depth. Moreover, you can hide or show each item (e.g. 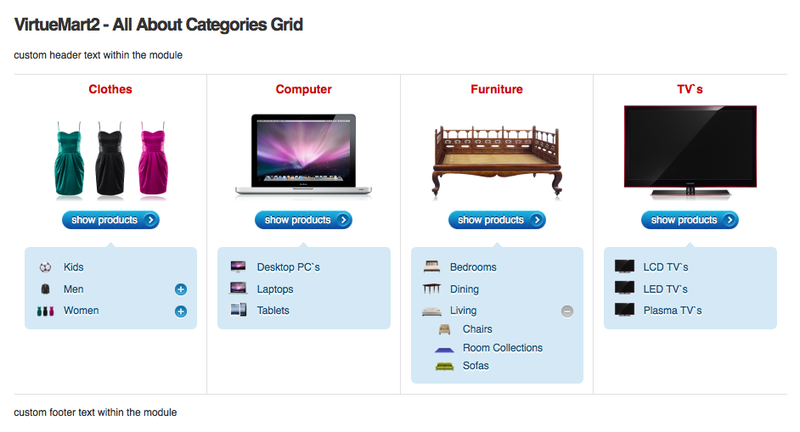 category name, category image, buttons). For the button linked to the product, you can set a custom text which will appear. You can even individually set whether or not you want to hide the horizontal and vertical separators. However, the best thing is that you can define the order of the individual prices. Thus, it is possible to show the sales prices after the tax amount or vice versa. It is up to you to determine the order of all prices. In addition, you can also define the number of decimal places for rounding. To put more emphasis on special products, you can define badges for certain products. Thus, you can, for example, show the text "on sale" to highlight a discount. Not , but the developer went above and beyond helping me fix a problem that caused another module not to display while theirs was published. The problem was with the other module which they fixed themselves.